The Lumberjack was founded in January 1913 in the midst of a protracted labor strike by the Brotherhood of Timber Workers (B.T.W.) in Merryville, Louisiana. Published by the Southern District of the National Industrial Union of Forest and Lumber Workers, the weekly paper was edited by Covington Hall (1871-1952), a member of the radical wing of the Socialist Party in New Orleans. Hall had previously served as assistant editor of Oscar Ameringer’s Labor World, which Ameringer moved from Columbus, Ohio, to New Orleans in 1907. As editor of the Lumberjack, Hall called for the formation of timber workers’ unions in western Louisiana and east Texas and reported at length on the activities of the Industrial Workers of the World (I.W.W. ), with which the B.T.W. had affiliated itself at its annual convention in Alexandria, Louisiana, in 1912. In addition to news of local strikes and the labor movement, the paper carried news of timber workers’ strikes elsewhere in the United States together with editorials on general topics such as child labor and the Ku Klux Klan, which Hall commented on from a socialist viewpoint. Also of interest is Hall’s original poetry on labor-related subjects. 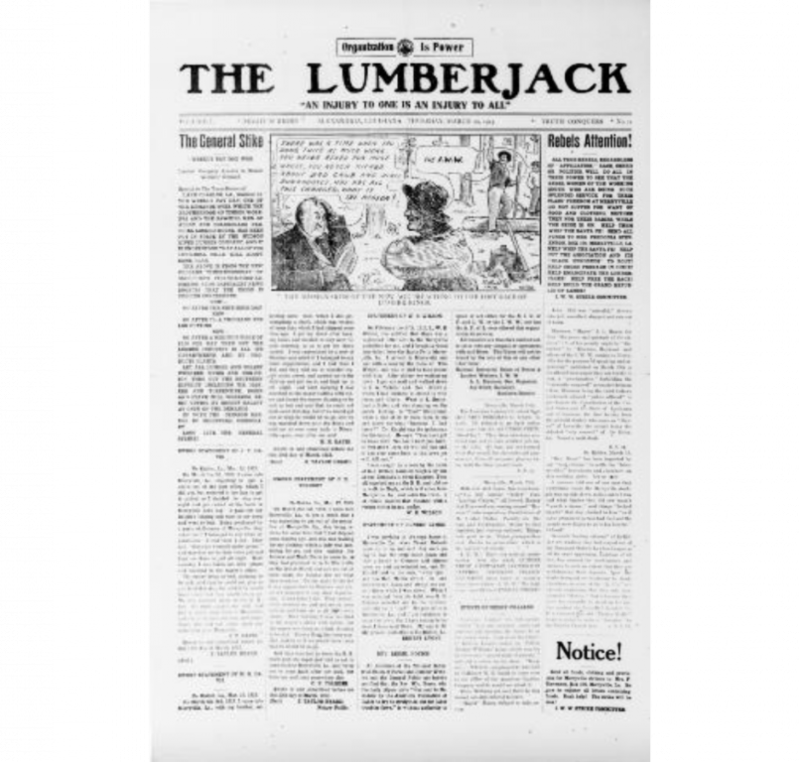 In July 1913, timber industry leaders persuaded the Lumberjack’s printer in Alexandria to stop printing the paper. Publication resumed in New Orleans under a new title, the Voice of the People. The Lumberjack’s motto, “An Injury To One Is An Injury To All,” was retained, as was its four-page, three-column format. The focus of reporting initially remained the same; by 1914, however, having grown frustrated with largely unsuccessful efforts to organize southern timber workers, Hall was devoting greater attention to the logging industry in the Pacific Northwest and Montana, as well as to labor disputes associated with the United Fruit Company in Central America and the Caribbean. Vol. 2, no. 46 was published concurrently, but with completely different contents, in New Orleans and Portland, Oregon. In July 1914, lack of support in the South finally led Hall to transfer publication of the paper in full to Portland, where he served as editor for two months before turning the job over to B. E. Nilsson and returning to New Orleans. The Voice of the People appears to have found no more of an audience in the Northwest than in the South, and its last issue was published on December 3, 1914. This and the other one are amazing, thanks for posting! This is awesome! Thanks much. Shame I couldn't find any of the Spanish language editions. I think this is everything in English about The Lumberjack and Voice of the People. The website had some cryptic talk of later issues of Voice but given that the printing had moved to Oregon and the last few issues kept appealing for more support I suspect it to be either reissuing a few copies or an in name only revival, Voice of the People is a pretty generic name for a Radical paper after all. Thanks for doing this! This was on my 'to-do' list. That's fine, after all I copied them from the Library of Congress though I had to merge them all and correct the "International Workers of the World" too.